If you are looking for a gift that is unique and special, these personalized certficates may be just what you have in mind. Along with using them as a gift for others, they also make a nice addition for your own home. The certificates are hand calligraphied with your personal information. 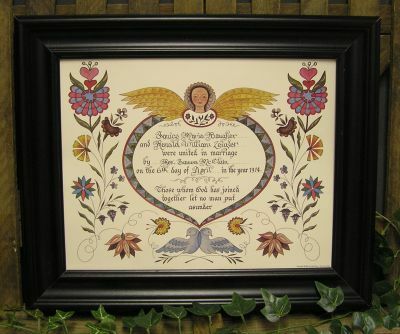 They come in three styles: house blessing, wedding certificate, and birth certificate. See the photos following for the details of each certificate as well as the framed options. The unframed size is 11 x 14. 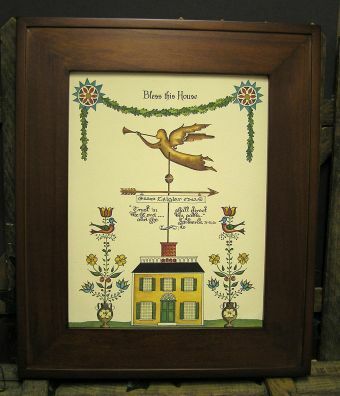 These house blessings make wonderful gifts for weddings, house warmings, and, of course, for your home. 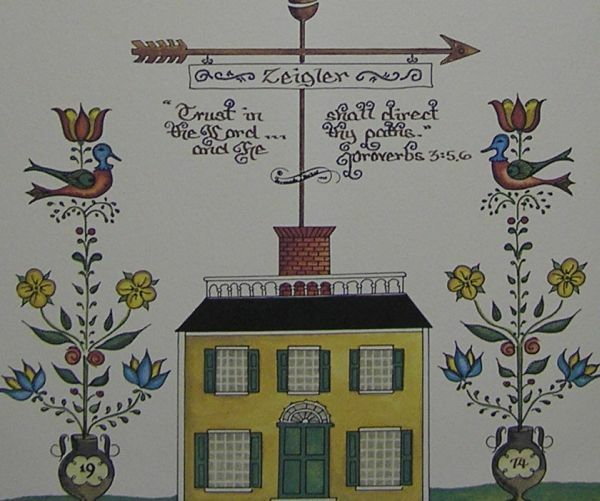 They include the last name, year (at the bottom in two vases), and optional verse of Proverbs 3:5,6. Make sure you include your information in the order or send in a separate e-mail. We will assume you would like the verse unless you let us know otherwise (you can have it plain or with another verse). 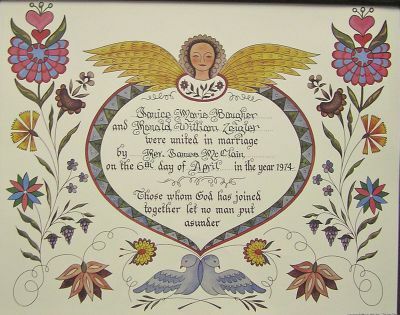 They are available in cherry frame (shown) or black frame (shown in wedding certificate) and are under glass and ready to hang. The finished size is 15 x 18. These certificates are the perfect gift for weddings, anniversaries, as well as many other occasions. 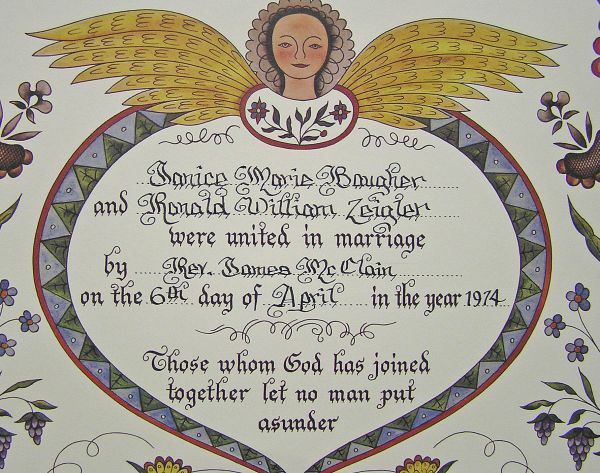 They include the bride's name, groom's name, officiate (we sometimes substitute church or location), and date (click on photo to see close up of calligraphy). Make sure you include the personal information in the order or separate e-mail. They are available in cherry frame and black frame (both shown in House Blessing) and are under glass and ready to hang. They measure 15 x 18. 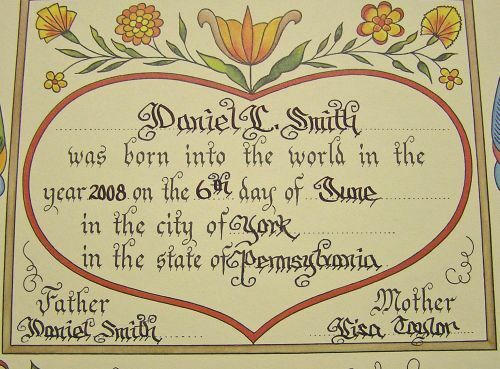 These certificates are a wonderful way to celebrate a birth, an adoption, or a birthday. 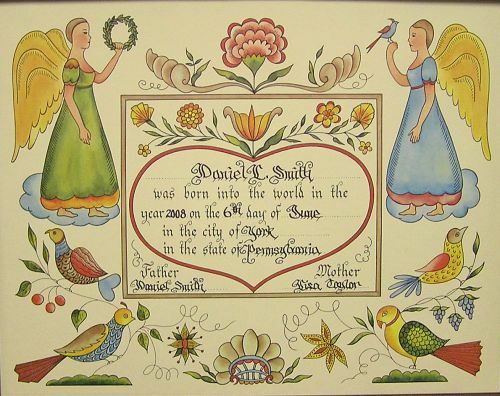 They include the name of the child, birthdate, city, state, mother's name, and father's name (click on photo to see close up of calligraphy). Send us your personal information with your order or in a separate e-mail. They are available in cherry frame or black frame (both shown in House Blessing) and are under glass and ready to hang.